On the 9th (Mon), don't miss a visit to Bairro de Santa Felicidade, stroll through Parque Tangua, then admire the natural beauty at Jardim Botanico de Curitiba, and finally do a tasting at Vinhos do Italiano. On the 10th (Tue), you'll have a packed day of sightseeing: take in the spiritual surroundings of Santuario Tabor Magnificat, then examine the collection at Museu Oscar Niemeyer MON, and then tour the pleasant surroundings at Parque Barigui. For photos, reviews, traveler tips, and tourist information, use the Curitiba visit planner. If you are flying in from Brazil, the closest major airport is Afonso Pena Airport. In September in Curitiba, expect temperatures between 26°C during the day and 15°C at night. Finish up your sightseeing early on the 10th (Tue) so you can travel to Patong. Patong is known for shopping, beaches, spas, wildlife, and nightlife. Your plan includes some of its best attractions: discover the deep blue sea with a scuba or snorkeling tour, identify plant and animal life at Wildlife Areas, get outside with Patong Beach, and look for gifts at Armani Fashion. To find ratings, maps, photos, and other tourist information, read Patong trip planner . Fly from Curitiba to Patong in 31 hours. Alternatively, you can do a combination of bus and flight; or do a combination of shuttle and flight. The time zone difference moving from Brasilia Time (BRT) to Indochina Time (ICT) is 10 hours. Traveling from Curitiba in September, expect Patong to be a bit warmer, temps between 36°C and 27°C. Cap off your sightseeing on the 15th (Sun) early enough to travel to Koh Tao. On the 16th (Mon), see what you can catch with a fishing tour and then discover the deep blue sea with a scuba or snorkeling tour. For maps, more things to do, where to stay, and more tourist information, refer to the Koh Tao trip itinerary maker app . You can do a combination of bus and flight from Patong to Koh Tao in 7 hours. Alternatively, you can do a combination of bus and ferry; or take a bus. Traveling from Patong in September, plan for a bit warmer nights in Koh Tao, with lows around 31°C. Finish your sightseeing early on the 16th (Mon) so you can travel to Bangkok. Bangkok is known for historic sites, shopping, nightlife, spas, and museums. 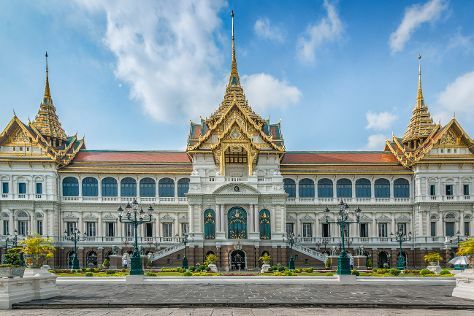 Your plan includes some of its best attractions: explore the historical opulence of The Grand Palace, take in the spiritual surroundings of Temple of Dawn (Wat Arun), relax and rejuvenate at some of the best spas, and explore the ancient world of Wat Pho. To see other places to visit, traveler tips, reviews, and other tourist information, go to the Bangkok tour builder tool . You can do a combination of bus and flight from Koh Tao to Bangkok in 6.5 hours. Other options are to take a bus; or do a combination of ferry and train. In September in Bangkok, expect temperatures between 38°C during the day and 30°C at night. Wrap up your sightseeing on the 19th (Thu) early enough to travel to Hanoi. Hanoi is known for historic sites, nightlife, museums, spas, and nature. Your plan includes some of its best attractions: contemplate the waterfront views at Lake of the Restored Sword (Hoan Kiem Lake), take in the pleasant sights at Travel Agent Hanoi, contemplate the long history of Ho Chi Minh Mausoleum, and indulge your taste buds at Food & Drink. To find ratings, traveler tips, reviews, and tourist information, read our Hanoi travel route planner. Fly from Bangkok to Hanoi in 5.5 hours. Alternatively, you can drive; or take a bus. Finish your sightseeing early on the 22nd (Sun) to allow enough time to travel to Ho Chi Minh City. Kick off your visit on the 23rd (Mon): take an in-depth tour of War Remnants Museum, then take in the spiritual surroundings of Chùa Giác Lâm (Giac Lam Pagoda), and then don't miss a visit to Cu Chi Tunnels. Keep things going the next day: take in the architecture and atmosphere at Saigon Notre Dame Cathedral, then ponder the world of politics at Central Post Office, then browse the eclectic array of goods at Ben Thanh Market, and finally indulge in some culinary diversions at a local gastronomic tour. To see traveler tips, more things to do, ratings, and tourist information, read Ho Chi Minh City online travel planner . Fly from Hanoi to Ho Chi Minh City in 3.5 hours. Alternatively, you can do a combination of train and flight; or drive. September in Ho Chi Minh City sees daily highs of 38°C and lows of 28°C at night. Wrap up your sightseeing on the 24th (Tue) to allow time to travel to Seminyak. Get out of town with these interesting Seminyak side-trips: Uluwatu Temple (in Pecatu) and Tanah Lot Temple (in Beraban). The adventure continues: make a splash at Waterbom Bali, admire the masterpieces at Purpa Fine Art Gallery Seminyak, take a tour by water with Boat Tours & Water Sports, and shake up your sightseeing with a climbing tour. To see reviews, maps, more things to do, and more tourist information, use the Seminyak travel route planner. Getting from Ho Chi Minh City to Seminyak by combination of flight and bus takes about 9.5 hours. The time zone changes from Indochina Time to Central Indonesia Time, which is usually a 1 hour difference. In September, daily temperatures in Seminyak can reach 35°C, while at night they dip to 27°C. Cap off your sightseeing on the 27th (Fri) early enough to go by car to Ubud. On the 28th (Sat), indulge in some personalized pampering at some of the best spas, then take in the spiritual surroundings of Tirta Empul Temple, then look for all kinds of wild species at Sacred Monkey Forest Sanctuary, and finally view the masterpieces at Threads of Life. Keep things going the next day: see the interesting displays at Neka Art Museum, contemplate in the serene atmosphere at Saraswati Temple, then make a trip to Tegalalang Rice Terrace, and finally identify plant and animal life at Elephant Safari Park. For traveler tips and tourist information, refer to the Ubud trip planner . Ubud is just a stone's throw from Seminyak. September in Ubud sees daily highs of 35°C and lows of 27°C at night. Wrap up your sightseeing on the 29th (Sun) to allow time to travel back home.